This soup is so satisfying. 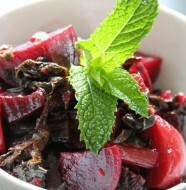 It’s flavorful, light and healthy. It’s also hearty because of the yummy little meatballs. 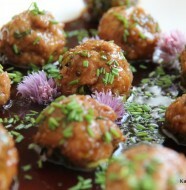 Add different vegetables or use different meat for the meatballs, like ground chicken or veal. Some fresh bread would go nicely with it. 1. Turn the heat up to medium high on a medium sized, heavy bottomed pot. Add the oil, then add the onions, celery, pepper and minced garlic. Cook until the onions are transparent, about 5 minutes. 2. Add the chicken broth and red chili flakes to the onion mixture and bring up to a simmer, then turn the heat down to medium. 3. In the meanwhile, mix together the meatballs. Mix the ground turkey, egg, breadcrumbs, salt, pepper, 1/2 teaspoon minced garlic and green onion together. With wet hands(the ground meat won’t stick to your hands if they are wet) roll the turkey mixture into quarter size balls. Set aside. 4. When the broth is simmering, carefully add the raw turkey meatballs. Then cover the pot while everything is simmering for about 5 minutes. Do not let the broth come up to a strong boil or the meatballs may break apart. When the meatballs are white looking(cooked) and feel solid, add the chopped swiss chard. Now cook another 6-8 minutes on simmer. 5. 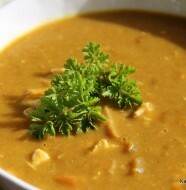 Taste the soup and add 1 teaspoon of salt and 1/2 teaspoon of ground pepper, you will probably need to. 6. Add the fresh chopped basil and serve with a little freshly grated parmesan for garnish. 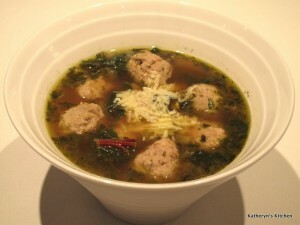 5 Comments on "Turkey Meatball and Swiss Chard Soup"
Made this soup last night, was so good!!! I browned the meatballs first. First time I ate swiss chard, very very tasty! I made fresh bread so it was a delicious meal. Matt added some more hot stuff, I liked it how it was! Just finished making this. It was a hit with my wife. Since I’m the epicurean, of course I had some ideas for tweaking. Overall, good dish! Needed a bit more flavor for me, so I added some cayenne pepper in addition to the pepper flakes. Also I wanted more greens! I added another two cups of steamed kale to the soup. Made it quite hearty! I will definitely make it again. Thanks. Thanks for the comments Dluv. I, like you, almost always tweak new recipes to our liking. I really appreciate you taking the time to comment, I love this soup. i made this soup Katheryn and it was very tasty, however, i didn’t make meat balls I just browned the meat. I will make it again with meatballs. The meat gets a little chewy other wise. Loved the flavor as did our friends.